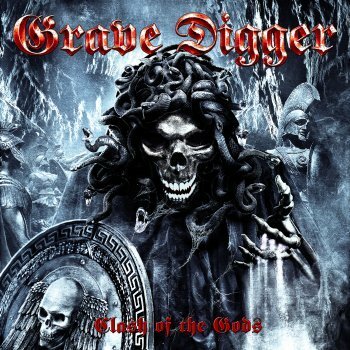 GRAVE DIGGER - CLASH OF THE GODS VINYL (2LP) | Online Shop | Wizard LTD. Album: "CLASH OF THE GODS VINYL (2LP)"
The highly acclaimed predecessor "The Clans Will Rise Again" was dedicated to the sheer mystique and the proud people of Scotland, but on their latest album, GRAVE DIGGER enters the legendary realm of Ancient Greek and its gods and creatures. The lyrics of "Clash of the Gods" pay tribute to the legendary Medusa, Odysseus, Hades and Kerberos amongst others. These tales are clad in sweeping Power Metal compositions filled with powerful riffing and catchy choruses. The songs range from fast and driving double bass tracks, anthemic mid tempo compositions up to rousing and simply beautiful Power Metal ballads. Crowned by Chris Boltdendahl’s charismatic vocals, the new album offers everything a true Metal heart desires! The magnificent artwork provides the finishing touches and together with the compositions, brings the legendary figures of Ancient Greek to life. "Clash of the Gods" is an unbelievable compact and energy driven opus and will grant GRAVE DIGGER themselves a warm welcome into the pantheon of the gods! An opus filled with gods, heroes and legends! Power Metal Hymns!